This striking wrought iron/fine mesh fire-screen has appeased another delighted Client who will make extensive use of it during the upcoming winter months. 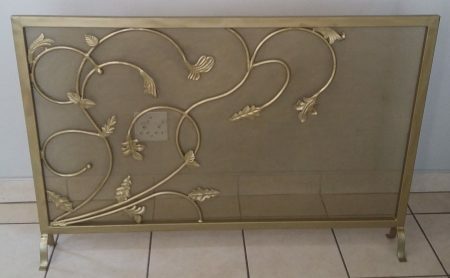 The fire-screen measures 1250mm x 770mm as per Client’s specification it can, however, be fabricated to suit any desired specification. 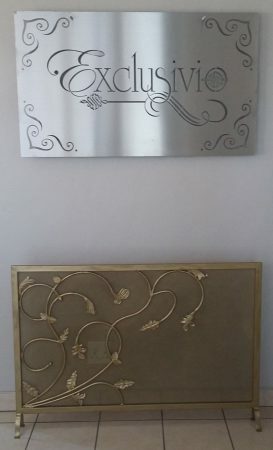 The frame is made up of 38mm x 25mm rectangular tubing, the scrolls are made from 12mm diameter round bar with decorative leaves, sprigs and orbs. 230B fine mesh puts the final touch to the eye-catching assembly. All the components have been stylishly assembled and finished in a pre-primed bronze coating.